I finally decided what books I will try to read during Bout of Books 15 read-a-thon, which will last from January 4th till January 10th. I'm thinking of reading 5 books. I am not sure if I will be able to read them all, but at least I'll try. 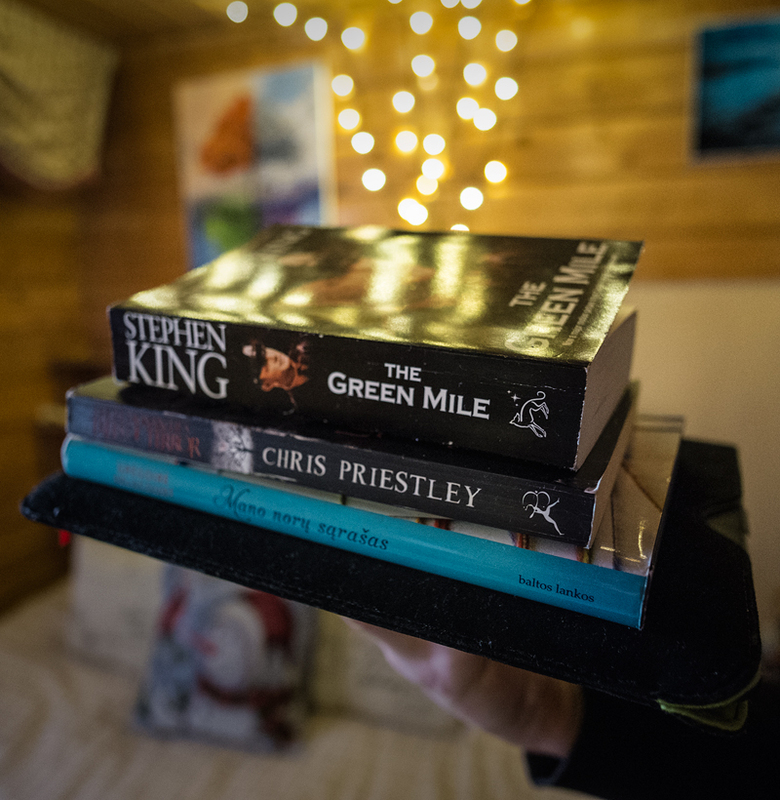 Firstly I will finish "The Green Mile" by Stephen King. There is only 100 hundred or less pages left, so it will be no problem for me. Then I will read Lithuanian poet Rimvydas Stankevičius book "Akys" ("Eyes" by Rimvydas Stankevičius). It is a January pick for my Lithuanian virtual book club. I have to confess, that I really don't like poetry, but it's a short book, only 73 pages, so it won't take long to get through this missery. I will use my pocket book for this book, because I don't want to own it in book form. After reading things that I don't like, I will start a book, that I, for sure, know will bring me joy. It is "Harry Potter and the Deathly Hallows" by J.K. Rowling. It will be a reread for me and I can't wait to start it. I also read this one on my pocket book, because physical copy is massive and it is hard to hold it all the time. Then, if I still have time, I will try to read and finish "Mano norų sąrašas" by Gregoire Delacourt ( original title "La liste de mes envies"). This one is sitting on my book shelf over a year now and it is definitely time to read it. Lastly I at least try to start "Uncle Montague's Tales of Terror" by Chris Priestley. If I don't finish it during the next week it's fine, because I have plenty of time after that.